Creating puzzles is a wonderful way to combine creative and critical thinking with kids. When you create picture puzzles, there are also opportunities for learning, and practising visual and digital literacy skills. Over the next months, I will be sharing ideas on how kids can create different kinds of picture puzzles. Today my focus is on how to create a digital spot-the-difference puzzle. How can kids create a digital spot the difference puzzle? 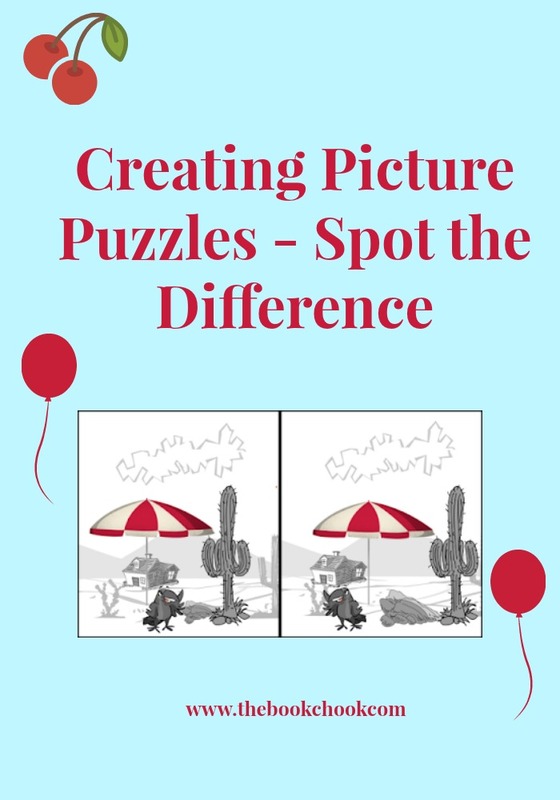 Before children begin creating the two spot the difference images they will need, encourage them to think about what elements in an image they can change to create differences. What elements can be changed that might not be spotted immediately? Kids can digitally manipulate colour, size, position and direction using many common image editors and apps. 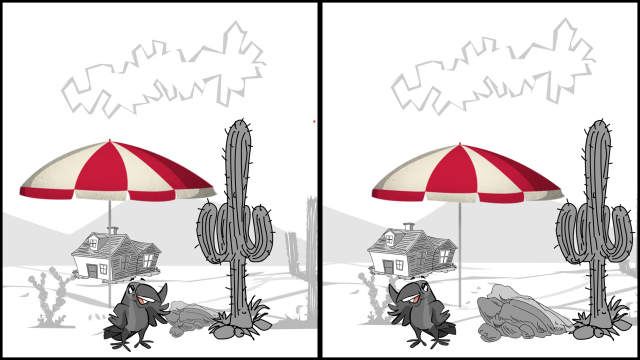 They can also put something in one image but omit it from the second image. Above you'll see a fairly simple spot the difference puzzle. I used the Comics Head app to create my two images. I chose a template with two frames side by side. This allowed me to set up the same backgrounds, then choose an element and duplicate it before positioning it on the canvas. I wanted to change positions, sizes, and directions of elements in my two images, and did this by dragging them into slightly different positions on the background. I then pinched to re-size, and took the option to reverse direction by tapping horizontal flip inside the image menu. Children could use other digital software that gives them options to create digital images, e.g. Pikmonkey and Canva. They could also set up two different but similar real world scenes and photograph them. Another way to make a spot-the-difference puzzle would be in a drawing editor like the free Google Drawings inside Google Drive. If kids make one image at top of their canvas, duplicate it underneath, then tweak the lower image to make slight changes, the result can then become another spot-the-difference puzzle for a fellow student to solve. To make the easy spot-the-difference bird puzzle above, I used Chrome for my browser and made sure I was signed into Google Drive. I went to New/More/GoogleDrawings. I opened a new canvas and set its dimensions under File/Page setup/Custom. I chose 640 x 360 pixels. Next I right clicked and chose a background colour. For my left-hand bird, I chose the shape menu, a cloud, made the border transparent, picked a bright pink, duplicated it, went to arrange/rotate/flip vertically and I had both my bird’s wings. 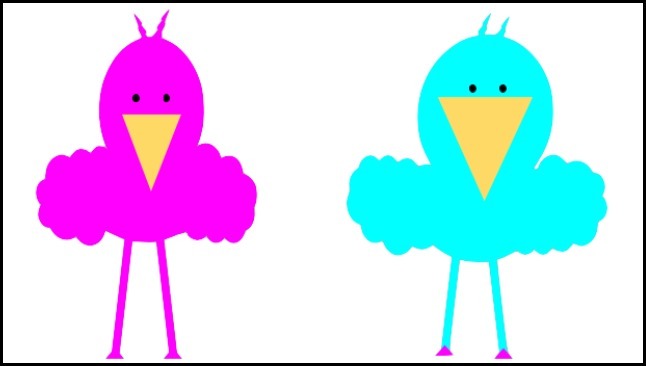 I used a pink circle for the body, elongated rectangles for the legs, small circles for the eyes and a triangle for the beak. For the second bird, I duplicated each shape but changed colours, sizes, lengths and orientation. It might not be immediately obvious, but I used Arrange/Rotate/Flip to make the wings turn up instead of down, made the head bigger, changed the position of the eyes and beak etc. If you hold the shift key down, you can go to Arrange/Group to keep both eyes together before you move them. If you don’t want a border, you need to keep making it transparent. Once done, I went to File/Download as, chose PNG for my filetype and downloaded the image to my computer. Making a digital spot the difference puzzle has one huge benefit to doing it the low-tech way. You can easily duplicate the original and then make slight changes to it. This keeps the majority of the image exactly the same. That’s sometimes tricky to do in a physical pen and paper type image. The other real benefit of creating a digital version of a puzzle is the opportunity for kids to develop and practice skills in using different kinds of technology. And of course, kids will have a lot of fun experimenting and making fiendish changes for a partner to spot! You might also be interested in Creative Prompt for Kids - Start with an Emoji and Word and Image Puzzles for Kids.